SEATTLE (AP) — Declaring climate change the nation’s most pressing issue, Washington Gov. Jay Inslee launched his 2020 Democratic presidential bid on Friday with a promise to refocus American government and society. The 68-year-old former congressman becomes the first governor to enter a race dominated by senators. Former Vice President Joe Biden and former Texas Rep. Beto O’Rourke also are expected to make highly anticipated 2020 announcements in the coming weeks. Inslee frames climate action as an economic opportunity, not just a moral imperative. He didn’t talk specifically Friday about the costs of his vision, other than to criticize considerable tax subsidies for the fossil fuel industry. But he argued that public and private investments in clean energy are a net boon for working Americans that would create “millions of jobs,” from building “electric cars in Michigan” to installing solar panels on homes in every state. Inslee hasn’t specifically endorsed the Green New Deal introduced by New York Rep. Alexandria Ocasio-Cortez and Massachusetts Sen. Ed Markey, and he didn’t during his speech Friday. But he said last month that he was “thrilled that this ... resolution has been brought forward” to push for action. Inslee announced his intention to “power our economy with 100 percent clean energy,” but he set no target date for the U.S. to become carbon neutral. The Green New Deal sets a target of 2030. 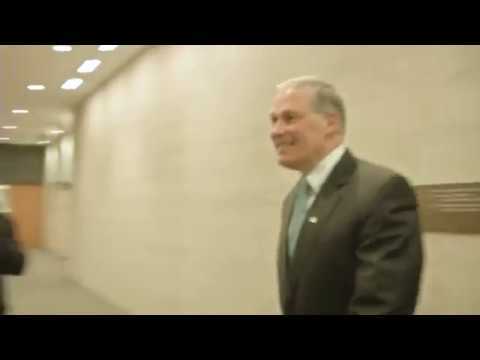 Despite his emphasis on climate policy, Inslee says he’s not a one-issue candidate. He pitches his breadth of personal and political experiences as ideal to bridge political and cultural divides among the Democratic base and the broader electorate. The state GOP recently has derided his “extreme environmental agenda” and pointed to its price tag. Inslee raised his profile serving as the chairman of the Democratic Governors Association in 2018; Democrats picked up seven governor’s offices, and Inslee became a familiar guest to cable news audiences, using the opportunity to lambaste Trump on such issues as immigration and ethics. “Unlike the man in the White House, I believe in all the people who make up America,” he said Friday. “If the rules change, of course everything will be on the table to figure out how we solve this problem,” he said, adding that, at this point, he would not commit to declaring a national emergency on climate. “The best way to do this is to work with Congress to develop a national consensus about how to build a clean-energy economy,” he said. Barrow reported from Atlanta and Hanover, New Hampshire. Associated Press associate polling director Hannah Fingerhut in Washington contributed to this report.